This popular best selling model is the smaller sister to the awesome 36HT and is perfect for those requiring a practical day cruiser on a smaller budget. It offers the same practical hardtop design which gives excellent weather protection from the heat and rain. With plenty of shaded seating on the cockpit and fore and aft bow seating there is plenty of space to find your favourite spot while cruising. 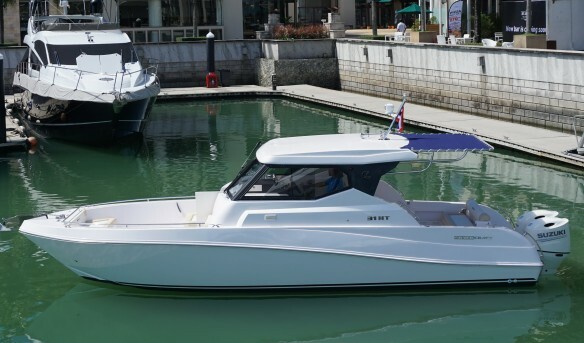 The boat is equipped with the reliable Suzuki 250TX mechanical shift engines and these are region correct in being E40 spec, and with these engines she is pretty quick at a 43knot top speed, which will then combine to a very economical cruise speed. Equipment includes anchor winch, GPS depth sounder, Zipwake interceptor type trim system, top of the line music system and more. This boat is also a perfect day charter boat.